Find out if your child could benefit from getting dental sealants in Bergen County. You want to make sure that your child’s teeth stay healthy, we figured that much. Maybe you are still brushing your child’s teeth or maybe they are doing it themselves at this point. You always think about their diet and make sure they are eating healthy, smile-friendly foods rather than foods and drinks that are unhealthy. However, there are some ways to protect your child’s teeth from cavities that only our Bergen County, NJ dentists can help with. Find out more about dental sealants and whether they are right for your child. Dental sealants are a fast, simple, painless and inexpensive way to protect your child’s teeth from cavities. Dental sealants have been around for a while but they are an easy preventive treatment option for your little one. This thin plastic material is placed over the chewing surfaces of your back teeth, which contain a lot of grooves and pits, to prevent bacteria and plaque from getting into these fissures and causing decay. Molars are particularly susceptible to decay because of all these nooks and crannies and also because it’s often harder for children to get all the way in the back to properly clean every surface of these teeth. This is why dental sealants can be a wonderful protective measure for your child’s teeth. With more and more kids developing cavities early in life, it’s never too soon to be thinking of preventive measures to protect their teeth. Sealants are a great treatment for children who aren’t the best brushers or who forget to brush their teeth sometimes. Of course, even good brushers can miss spots and that’s why it’s a good idea to consider sealants once your child’s adult teeth start to erupt. 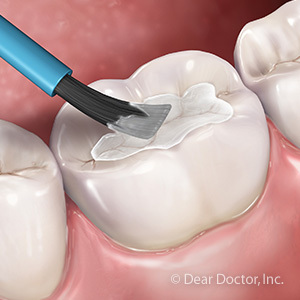 Do you have questions about dental sealants? If so, then it’s time to schedule an appointment for your little one with Gentle Dentistry in Bergen County, NJ. Let’s protect your child’s smile for life!